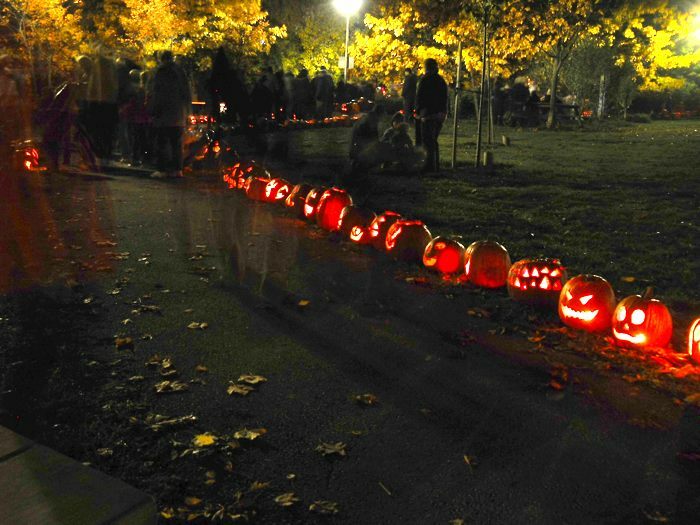 Every Nov. 1, the day after Halloween, the world-famous Pumpkin Parade takes place at Sorauren Park. With more than 1,500 pumpkins on display in recent years, the Parade is a neighbourhood and even regional highlight of the season. From witches and cats, to politicians and world events, the artful jack-o-lanterns represent the spirit of Halloween and also the spirit of the times. Add your pumpkin to the parade. It starts at dusk, with the busiest times after dinner. There is no competition… but will your pumpkin get noticed? And what will be the dominant theme this year? Place your pumpkins along the inside edge of the path around the park. We are hoping to completely encircle the park this year, and we can do that by not doubling up on both sides of the path. Plus, if we get everyone moving in the same direction around the park (think pleasure skating rink), it should be even more enjoyable. Walk or take transit to the park. The streets are narrow and busy and there is no parking at the park. The 505 Dundas and 506 College streetcars stop at the top of Sorauren, a three-minute walk from the park. The 504 King stops along Roncesvalles, one block away. The 47 Lansdowne bus stops at Rideau St., also a short walk away. Be safe. Big thanks to City of Toronto Solid Waste and Parks, Forestry and Recreation for their ongoing support. 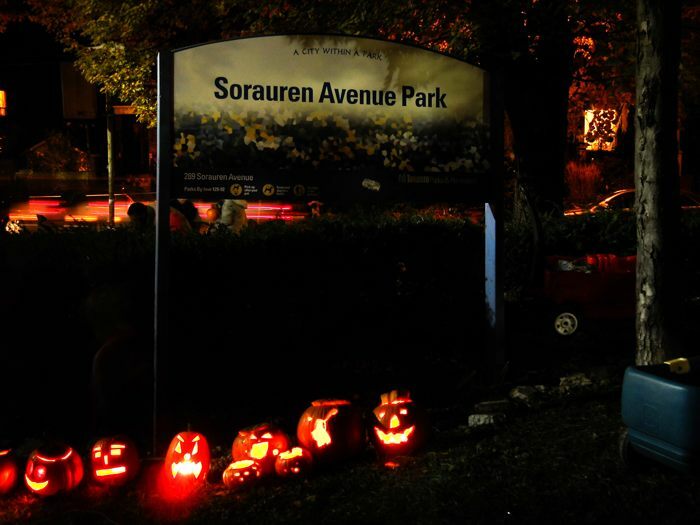 The Sorauren event was launched by neighbours in 2004 and has sparked similar events across Toronto, Montreal (Parade des Citrouilles) and in Upper Manhattan (hello Inwood). It has been blogged in Copenhagen. To see a video featuring Colleen Kennedy, founder of the Sorauren Pumpkin Parade, click here (thanks to Roncesvalles-Macdonell Residents’ Association). Park People and the City have also produced a video, shot mostly at Sorauren Park, about the enduring appeal of pumpkin parades. 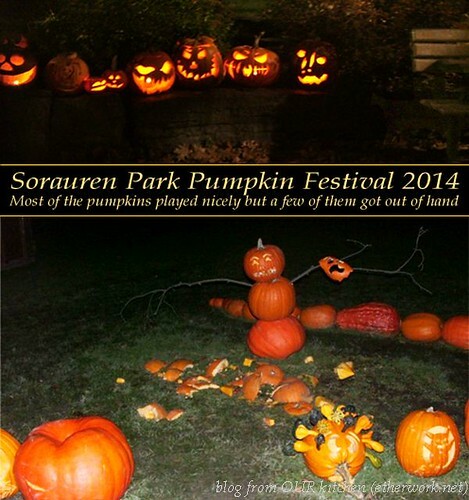 Put “sorauren park pumpkin parade” into your favourite search engine to find more great photos of parades past. I read in the newspaper today that the city will not be picking up the pumpkins this year. Does this mean the parade will be cancelled? I read that the city wasn’t picking the pumkins up this year. Has that changed? Councillor Perks has arranged for the pumpkins to be picked up. The pumpkin parade will march on. Hi! What’re the hours? This looks amazing. Folks drop off their pumpkins late in the afternoon and throughout the evenings. Looks best after sunset at 6:08 p.m., most pumpkins in place by 8 p.m. for sure. If the weather is clear, big crowds start forming by 7 p.m. ish. Enjoy! Best after dark as they will all be lit. This is a great event, I have gone a number of years in a row and last year decided to go to another park doing something similar but the one at Sorauren is way more impressive. The best Pumpkin Parade in the land. Will the pumpkins be still there on Sunday? The pumpkins are removed on Sunday morning, usually pretty early. Best to see them lit on Saturday night if possible. Sorry, the pumpkins will be gone by Sunday night. Very much an ephemeral event, catch it while you can! How are they lit up? Tea lights? Battery operated lights? Yes, they are lit up. Tea lights/simple wax candles that burn down are preferred. Thanks! 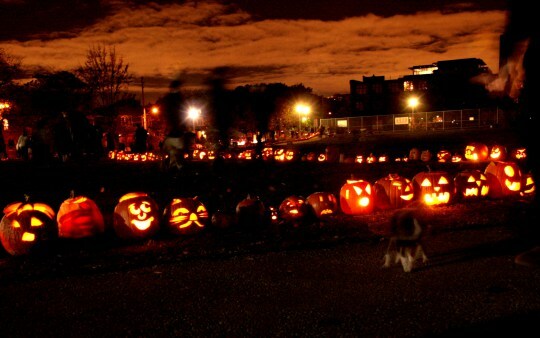 October 22, 2015 - 1:52 pm Pingback: Free Pre-Halloween Fun in Toronto | Kids in T.O. October 29, 2015 - 2:29 pm Pingback: Pumpkin Parades in Toronto | Kids in T.O. Thanks for the great idea! We are in our 2nd year and having a great time. celebrating the night with you.